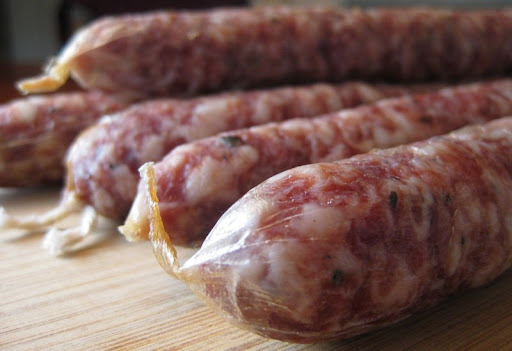 Thanks guys - "pure pork goodness" really describes this cured sausage. Uncomplicated, but intense. And really good. You guys did it again. These look very professional. I figured with the right spices and sweetener, one can easily use the same method to make Chinese lap chong as well. Hi Leela - we'll have to try making lap chong sometime. I did a little looking around, and I found multiple techniques - some using a smoker, some just drying, and some boiled and then dried. Have you found the fridge set up working good for you. I have a wine cooler that I use but I must say, that it is toooo small for all that I want to do! I have made the sec and I agree with you it's a good thing and will be making it again. Hi Jane - our fridge has been working great, and was really easy to set up. If you have the space for it, I think it is definitely the way to go. Thank you and I do have the space. I just didn't think it would grow as much as it has. For those of you reading.....get as big as you can or if you will be like me....have 2 (wasn't planned). It's all good. So what is next for you? I have lamb prosciutto in the fridge and it's on it's last week and then it goes into the chamber. Can't wait to see whats next for you also. Lamb prosciutto sounds good - let us know how it turns out. We did a Tuscan salami that came out very nicely, and a coppa that didn't. Right now, we only have cheese aging in the fridge, since we're leaving on a road trip soon. I'd like to do a duck prosciutto - we tried doing it at room temp before we got the fridge, and it didn't quite work out. One more comment. Ever use hog middles instead of hog casings? I just ordered some from sausage maker (.com) and found the wide "middles"(?) to be very thick skinned and, frankly, repulsive in appearance and smell. I'll be using plain old hog casings from now on - unless I mistakenly got the wrong item. 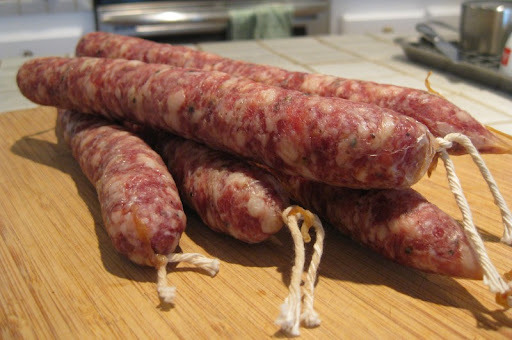 Hi Dave, I've never used hog middles, but we have used "narrow beef middles" from Butcher-Packer for a cured salami (about 2.5-inch diameter). Right out of the bag they had a rather unpleasant, musty smell and were thicker and more stretchy than hog casings. I cut off a couple 3-foot lengths and soaked them in lukewarm water for an hour, then rinsed and soaked some more. I even turned them inside out for good measure. Eventually the smell was gone (yay!) and they didn't seem so thick. The resulting salami turned out great, so I'll happily use beef middles again. Try cutting off a length and giving it a good, long soak with several changes of lukewarm water and see how it goes. (Keep the rest tightly sealed in the refrigerator.) If you're still not happy with it, no problem. The larger size can be fun, but the curing process takes longer, so standard hog casings are always a good alternative. This has provided me with the impetus I need to try my own cured sausage. I had been asking questions galore about the possibility of using a wine fridge with a glass door, for trying this stuff out as I ma happy to try stuff of this nature generally; but the whole curing/bacteria thing put me in fear of going horribly wrong with this so all the wonderful info is especially helpful. Not to mention the cured sausages look amazing and very tasty. Hi Grazor - it is all about proper temperature and humidity control. We haven't had a batch of cured meat go funky in the fridge yet. Thanks Mike. I have been all over your site this evening before and after going out tonight. Excellent stuff. I am in the process of trying to track down a Johnson Controls Fridge Thermometer and will taking a look for cheapo small fridges tomorrow. Now all I require I suspect is the pink curing salt. My current set up allows me the choice of smoking with a Bradley smoker or my Big Green Egg, which i find amazingly versatile. I made hot smoked salmon yesterday for a friend and managed under 200 for a couple of hours for what ended up as a decent product. My fears have been set aside based on your excellent blog, as I am now confident of a degree of success based on all your forays. Love your site and the wonderful stuff you post. Very excited at what I am hoping to try. Many thanks! Could you provide ingredients/instruction please? Haven't had this sausage since my Paris trip ten years ago! We use the recipe from Charcuterie. We've made it a few times now and have been very happy with it. How long will it keep once cut into? Once it's done curing we wrap it first in paper, then in plastic and store it in the refrigerator where it will stay nice and flavorful for at least a month or two. Cutting into it doesn't seem to make a difference here, however too much exposure to light can make the fat go off, and too much air will oxidize and/or dry out the meat, so be conscious of this when wrapping for storage. What a great site! I just got the Charcuterie Book to learn about saucisson. I would like to try a venison-pork saucisson. Any recommendations on how much venison & pork I should use for the 5lb Charcuterie Saucisson recipe? The venison being so lean, I don't know where to begin. Thanks for sharing all this great info! Since we haven't done saucisson with venison, these suggestions are untested! But it should be tasty. Good luck! 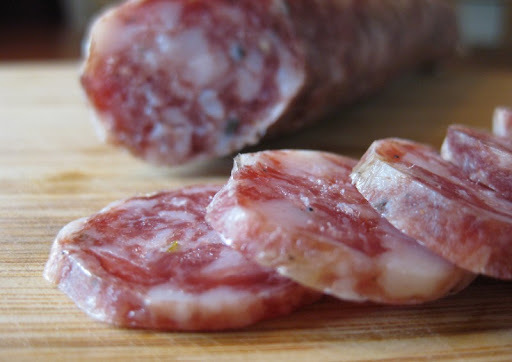 What kind of pork do you use in your dry cured meats? Do you use meat from the grocery store or do you use organic meat. We have used a variety of sources ranging from Asian and Mexican markets to our local butcher to direct from the pig farmer. I can't remember for sure, but I think this batch was made with pork from Da-Le Ranch. this looks like fantastic construction. nice work! I'm a week and a half into curing my first saucisson, and it's drying very flat instead of round. Any suggestions for next time? Hi Weslie, Perhaps you're drying them while lying on their sides? We hang them vertically from hooks and have never had trouble with flatness. You can see a picture here. where do you post the recipes?